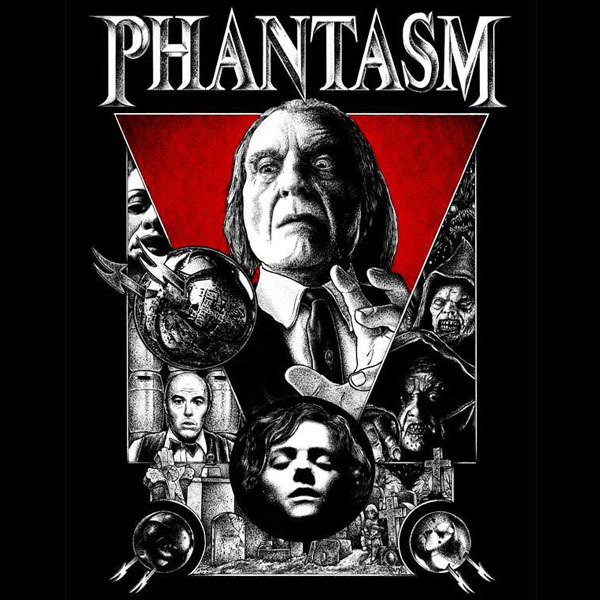 Horror collectible shop Pallbearer Press has unveiled a brand new t-shirt tribute to Phantasm and it's something you're probably going to want to get your hands on. The design draws on a handful of elements from the entire series with strong emphasis on the original film. You've got young Mike, younger Reggie, the Lady in Lavender and the finger-bug creature. You've also got Phantasm II dwarves lurking nearby and a Phantasm III-era Tall Man lording over the design. Way cool. The shirt is currently going for fifteen clams over on their website. It looks to be the perfect clothing item for your imperfect flesh that ties you to time and space. With any luck, we can look forward to a dazzling array of new Phantasm wearables this year and next with the pending release of Phantasm Ravager and the much hyped Blu-Ray debut of the series. Love this!!! What a Phantastic Tribute! !